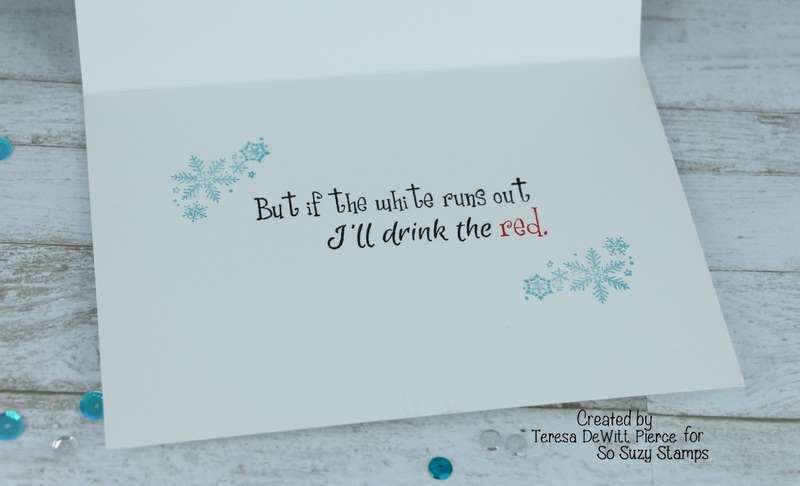 Welcome to the So Suzy Stamps Snarky Blog Hop where funny and humorous Christmas cards take over! 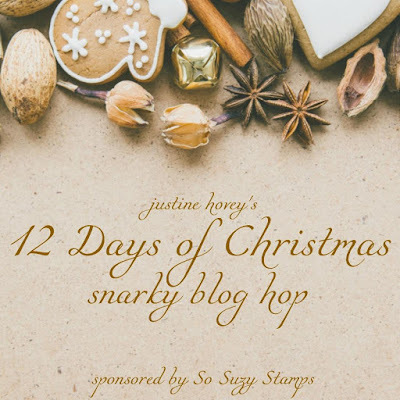 I am hopping along with Justine’s 12 Days of Christmas Series. If you haven’t checked it out yet, click here. Justine has been busy creating a dozen Christmas Card video tutorials to inspire you this holiday, and best of all there are prizes to be won every day. All you have to do to be eligible to win a $25 gift certificate is comment on each of the blogs! Good luck! We will pick two winners on November 9th! If you have arrived here from Tracy's blog you are in the right place. Below is the order of the hop in case you need to start back at the beginning. If you were to only buy one stamp from this new release you can’t go wrong with the bowl stamp. It is so versatile that I’ve used it on several of my own projects, including Halloween (as a cauldron), a bowl for a fish or flowers, and as I‘ve used it here, a snow globe. Now for a look at the inside of this card! Isn’t this funny! I’m more a fan of red wine to begin with so of course running out of white would be just fine with me lol. I’ve created a video for this project since it’s fairly involved and some of it is difficult to convey just in writing. I will have a list of the products used at the end of this post. I do use affiliate links for these (it doesn’t cost you anything extra if you shop using them) and appreciate you supporting my work on the blog. Thanks for stopping by! Next on the hop is Cornelia. Don't forget to leave a comment so you are entered into the drawing. I love the combination of a gorgeous, traditional card with the snarky sentiment. Definitely the way I operate! Beautiful card. I have used alcohol inks and Ranger yupo but wasn't happy that the ink dries chalky and can be scratched or rubbed off. But you make me want to try again. Alicia - you're a girl after my own heart! So glad you stopped by today! Beautiful card - love the sentiment! This is a perfect card for many of my friends who love wine. Cute! Heike - thank you- it made me crack up the first time I saw the sentiment. Oh, I know somebody who that would be perfect for. So cute. Great card and love the “snarky” sentiment. Thanks for sharing. So glad you liked it Judy - thanks a bunch! Fun card....beautiful outside and funny inside. OMG What a Gorgeous Card!! It was fun watching you create it and being able to see your vision come to life. Your card definitely has a twist....Love all of your ever so clever and creative ideas. YOU SO ROCK!! Beautiful snow globe card. The sentiments are so funny. This sentiment cracks me up! I’m a snow globe collector, so I totally loved this card. Great design and creativity, with a great sentiment. That card is absolutely Gorgeous!!! I LOVE ❤️ LOVE your background piece. Every step had some new great tip or special touch. Amazing card!!! Wow!!! Hi Kerry - I have to tell you that it makes me happy to know when I've provided the extra "something" that helps a fellow crafter out. Thanks so much for your very sweet comment and I hope you visit me again! Beautiful card and funny sentiment. Love your card. Shaker cards are such fun. Thanks Stanlee - yes I love them the best - I like experimenting with different "fillers"
Hi Theresa - glad you liked it! Beautiful snow globe! Thanks for sharing! Love the versatile use of the bowl stamp and it is perfect as a globe! Great card! Roberta - I'm telling you it's truly a good one for all sorts of stuff. Thanks for stopping by and leaving me some feedback! Very beautiful and funny card! Love all of the techniques that you explained in your video. Thanks for sharing! totally unexpected!! :D luv the design! Cute card! Love that it’s a shaker card! I agree, I wouldnt mind running out of white too! Oh, my goodness, too funny! I need that sentiment! Amy - glad you liked it too! It's a great one and hopefully I've done a good job today of enabling ha ha. Love this card. The background is gorgeous. I also wanted to thank you for the tip of cutting on a glass cutting mat, I get so frustrated when I use my blade to cut and it gets stuck. I am going to get myself one. Hi Tracy - yes when I found out how much easier it was to use the glass cutting mat I thought "where the heck have you been all my life"!!! Thanks for stopping by and glad that my little tip was helpful. Love the card. I love stamps that you can change up love that. Thanks for the inspiration. Debbie - thank you so much! I love to hear when I've inspired someone on different ways to get more use out of something - after all we spend lots of bucks on this stuff and we should get our money's worth out of it! Great card!! I'd add chocolate!!! Heather - what a FABULOUS idea! Wish I'd thought of it! Thanks for stopping by! I thought I was on the wrong blog to begin with, the front of the card was so beautiful. The snark comes from inside... well done! I think I need that sentiment! Great card!!!! Hurray! Thanks team-mate! I adored your card for the hop too! What a great set of stamps. The bowl could be used for some many things. Love the sentiment, perfect for the wine drinks in my family. Thanks for sharing. So glad you stopped by - yes that bowl is something that will span all seasons and I definitely recommend it. Thanks for taking the time to stop by and leave me a comment! Love how you used the bowl as a snow globe! !! Thanks Shanikka - I'm sneaky like that. I appreciate your comment very much! Hello Lynn - they really are fun to do! Thanks for your feedback on the video - appreciate it a lot. Hi El - aren't they fantastic! So Suzy has so many great ones. Thanks for stopping by. That's a really cool card ! Haha! Love the sentiment! I know exactly who I’d make this card for. So fun! Becky - thanks and one more thing....DO IT! Awesome card!!! Love it!!! The sentiment is so fun! Very pretty shaker card. Thanks for the technique hints. The cute snarky part is a surprise on the inside. Well done. Great card! I’m a bigger fan of Red too! Great card! Especially love the background. Thanks Wendy - it actually was the starting point for me when I designed this one. Funny how this works sometimes! Lovely snarky card! I need to try and make one of those shaker cards. Thanks for sharing. Mary - you totally should try it! It's addicting. Thank you! Glad you liked them both! Thanks for your comment! A girl after my own heart!!!! Here's to a happy season. Absolutely! thanks Gramma Sarah - appreciate you stopping by! Your card is perfect!! Great sentiment! Hello Laurie - what wonderful praise - thank you very much! I have a girlfriend who would love this card! The snark sorta sneaks up on you! Lol! Wendy - my favorite kind - the sneaky snark! I think you should go ahead and make your friend one like it! CASE me! Wow, neat how you used the glass bowl. I always love the new ways to use a stamp. Great card. Love the sentiment which is so unexpected based on the front of the card. Brilliant idea for the bowl and I'm with you on the red wine. Thanks for sharing. 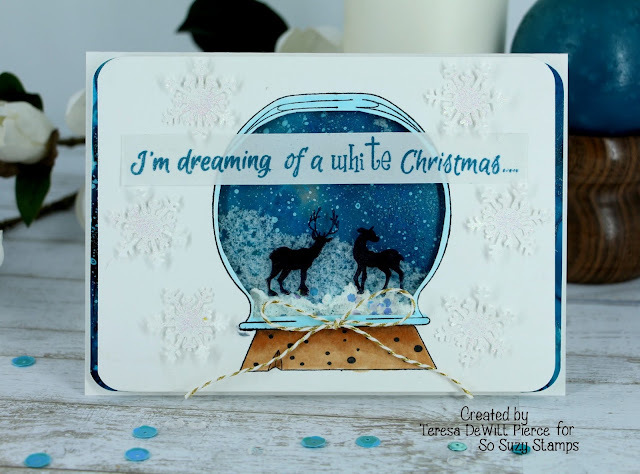 Beautiful snow globe card and I love the sentiment! Very fun card! Love the glass bowl stamp... gotta check that out and add it to my wish list! Denise - I greatly appreciate you taking the time to stop by and leave me a comment. You truly can’t go wrong with this stamp! What a great idea with the bowl stamp, and a beautiful card altogether! Thank you Sara - I appreciate your sweet comment. I absolutely love this! Your card is just gorgeous and I love the sentiment. I also love stamps like this that are so versatile. Hi Rebecca - thank you so much! This stamp is definitely on my top 10 list. What a versatile stamp - I love the idea of a cauldron for Halloween. Lovely, lovely card with a superfun sentiment! Perfect for the holidays!! Heidi - thank you for taking the time to leave such a sweet comment. I’m so glad you liked it! Lovely snowflakes, thinking it was a pretty Christmas card and then bam, the inside makes you laugh so hard you have tears. Wonderful card and thanks for the laugh. 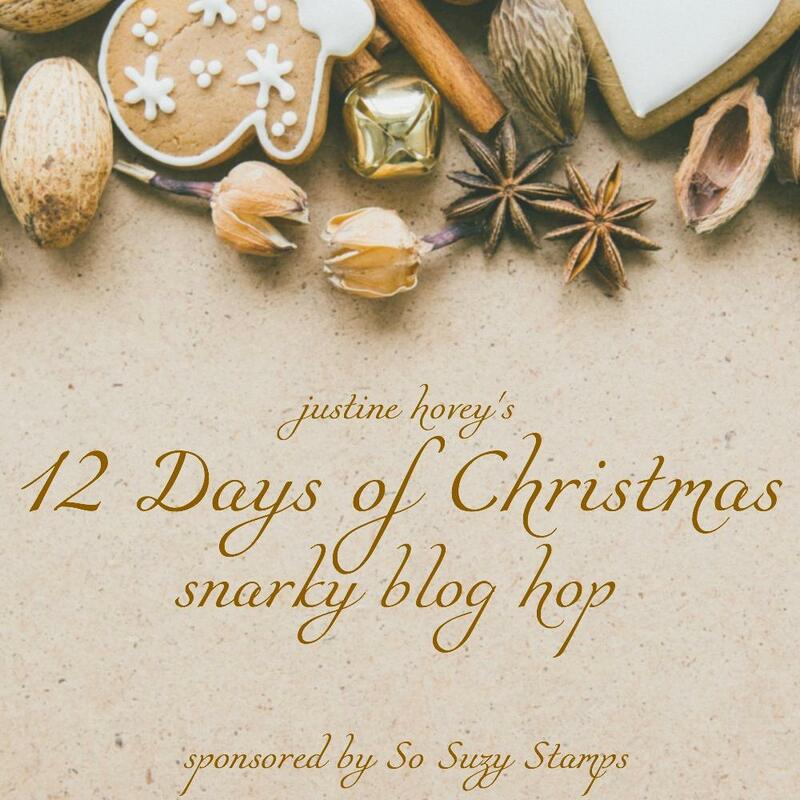 Love the snarky blog hop. We need more smiles and laughter like this. Thank you so very much. Put a smile on my face and tears down the cheek. Oh Cindi - if you only knew how much I enjoyed reading your comment! Your reaction is exactly what I was after and it makes me happy to know I’ve made people smile and even laugh with this card. Thanks again dear! Thank you so much Teresa. I greatly appreciate your very kind comments! This makes all the work worthwhile. Very beautiful card and a good laugh when you open it up!! Thanks Jackie! It's great to make people laugh. Hi Maggie - you have a deal! Thanks so much for stopping by and I appreciate your comment and hope you like the video! Love the very funny sentiment. It's fun alright - thanks! That bowl is just too cool. I have a lot of friends who would get a kick out of this card!! Thank you Wanda - maybe this gives you some ideas if you decide you must have this stamp yourself. Thanks for visiting. Best sentiment I've seen in a long time! Great card. Thanks for sharing your design. You are very welcome Denise - thanks for taking the time to check it out. I love your card. Love stamps that have multiple occasions to use them. Thank you for sharing. Great card!!! i love stamps! Beautiful card, love a shaker card! This stamp set is a Must-Have! Just love it! Thank you for sharing! So cute! Love the unexpected sentiment!! I love your card, Teresa!! Super fun! This stamp really seems like it would be versatile year round. This totally made me LOL. The outside is so love and the inside just so funny! Awesome card. My sister would love it. I'm trying to build some courage to try alcohol inks. I like how your background turned out. The background is amazing! Alcohol inks are on my list to buy and try. Absolutely stunning card with an amusing twist inside. Thanks for the inspiration and helpful tips! What a fun card!!! So trye too, huh?!? Love me some red wine also in fact I'm dreaming of a red (wine) Christmas, whoever can keep the white all together!!! Hahaha!!! Thanks so much for making me smile and for sharing a fun card!! I love how the outside of the card is so traditional and then you get to the inside sentiment, hilarious. Love, love, love this card! You see the beautiful card and then it's like someone is telling you, "Wait for it...." and you open it. Wonderful! Sensational card! Really beautiful - fantastically humorous. I've gotta pick up some of those sentiments; they are perfect for my group. I love this fun card! No one would know what lurks within! Love your snowglobe shaker and the alcohol inked background. They're on my list of supplies to dig out this weekend to play with! I don't have Yupo but I do have some glossy paper that should still work with them for this technique. Great sentiment, btw!!! It's great when one stamp can be used for various options such as bowl and snowglobe. I love shaker cards.Just adorable. So fun, and a bit of a surprise when opened! I hadn't thought to use fun foam to cut out the window on a shaker--great tip! And love the background. One more thing: I am not sure I have ever seen anyone use the MISTI for StazOn--but it's the perfect thing when using StazOn and acetate, isn't it?! No more sliding stamps! (And no more 2 out of 12 images I can use on shrink film for the grandkids!) Thank you SO much. Beautiful and funny now that's a great combination! Thanks for the great tips too! Love this! Thanks for the great tips!! Great Card! Love the surprise sentiment. This gives white Christmas a whole new meaning! awesome card and perfect sentiment for Christmas lol!!! This is so so cute! I love shaker cards...and love the creative way you used this stamp! What a great card! Your shaker card looks flawless. That sentiment is outstanding too!! This is my kind of a card! Beautifully done, and I love, love the sentiment! Like that you used stamp for different looks! Gorgeous shaker card!!! Thank you!! Beautiful card on the outside and funny on the inside! What a great card, and a fun sentiment! That stamp does look versatile. Your card turned out great. I love all the details! Thanks for sharing. Your card is gorgeous & that sentiment is Hilarious! I have several friends it would be perfect for! I think I need it! Wonderful card! I love the sentiment and the card construction is beautiful. This would be a perfect card for a few of my friends. Very nifty & humorous too, I know a few people that I can share this card with. Such pretty alcohol inked yupo! Really like this, so pretty and traditional looking on the outside and then WHAM, the snark gets you on the inside! GREAT job. I like the cork detail on the snow globe. The sentiment is nice bit of humor! Suych a fun card and I love the inside sentiment. The snowflakes are so pretty too!